where is the magnetic flux density, is the current density, and is the permeability of vacuum. where the field is called the magnetic vector potential. The electric potential allows for a more efficient way of expression for the equations of electrostatics and steady currents. In a similar way, the magnetic vector potential allows for a more efficient way of formulating the equations of magnetostatics, as shown further below. 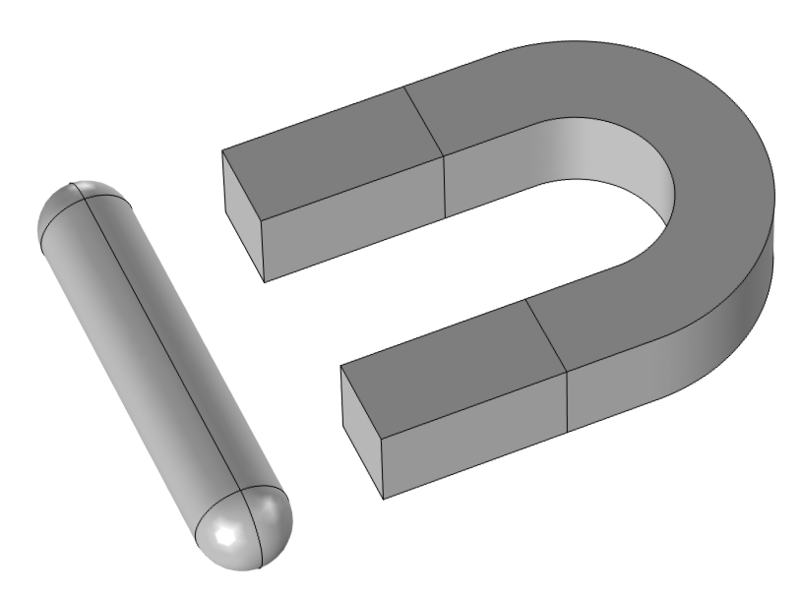 A magnetic material is characterized by having a permanent or induced magnetic moment. Because of this, the magnetic flux density inside a magnetic material will be different from that of free space. where is the magnetic permeability. where, for historical reasons, in the magnetic case, the coefficient of proportionality occurs as a reciprocal, and the magnetization field has a negative sign. where is the free current density. where is the magnetic susceptibility. where two new useful quantities are introduced: the relative permeability, , and the absolute permeability, . where is the inverse of the permeability tensor, . where is the current through the closed contour C and is the surface current density. The meaning of Faraday's law in the theory of steady currents is identical to that of electrostatics. The meaning of the current conservation equations can be summarized in words as follows. Gauss's magnetic law There are no magnetic charges. The magnetic flux is conserved. The magnetic flux lines always close upon themselves. The normal component of the magnetic flux density is continuous. Maxwell–Ampère's law (magnetostatics) The curl (infinitesimal circulation) of the magnetic field at a point equals the current density at that point. 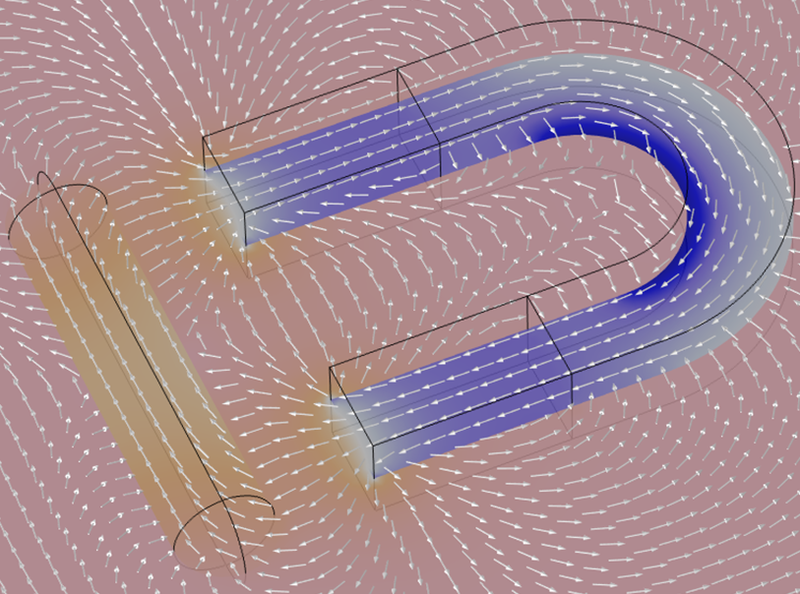 The circulation of the magnetic field around a closed path equals the current flowing through the surface bounded by the path. 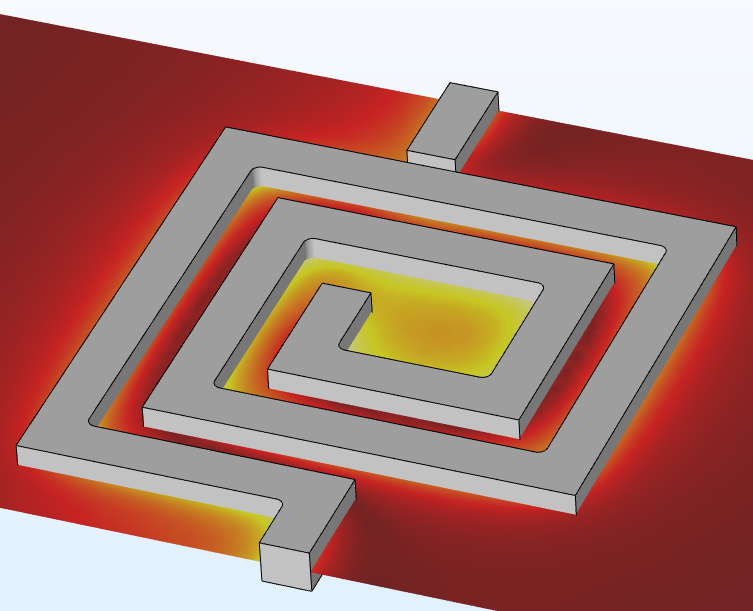 The surface current at a material interface equals the jump in the tangential component of the magnetic field. A spiral inductor carrying a steady current. The flux lines corresponding to the magnetic flux density, , are visualized in the surrounding air. The flux lines are color coded according to the magnitude of the flux. Blue and red represent low and high magnitude values, respectively. The magnitude of the magnetic flux density, , on a plane through the main structure of a spiral inductor. Red and white represent low and high magnitude values, respectively. This equation is analogous to the equation of electrostatics and can be used, for example, to model permanent magnets. The left image displays the magnetic flux density, , around a permanent horseshoe magnet and an iron rod. The arrows show the directions of the magnetic flux density, and the color of the intersecting plane shows the magnitude of the flux. Pink and blue represent a low and high value of the flux magnitude, respectively. The right image shows the corresponding geometry. For nonlinear materials, a more complicated expression is needed, since the history of the "magnetic loading" of the material is important. 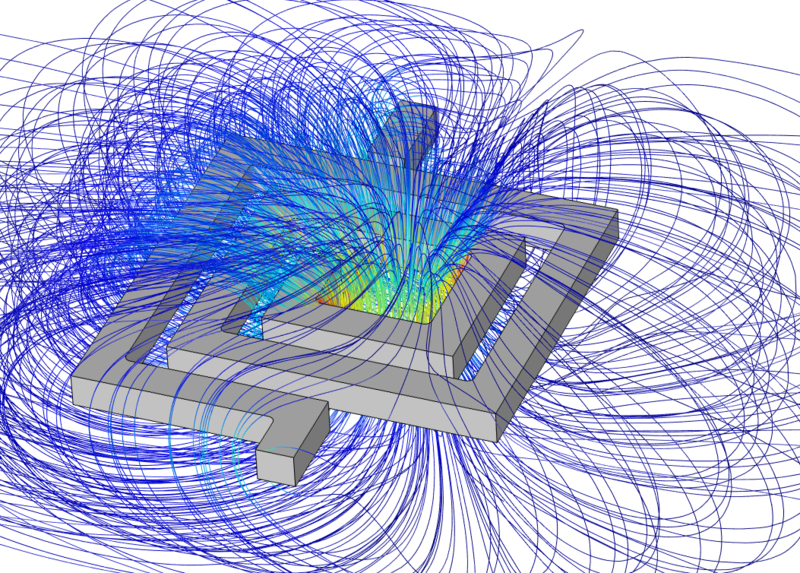 The concept of magnetostatic energy is useful when computing electrostatic forces and inductance values.